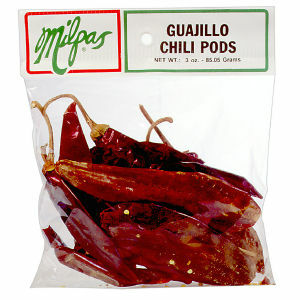 Milpas Chile Guajillo Pods (Annuum) are dried and then hand selected and hand packed under the strict Milpas quality control. These pods have just the right moisture at packing time that allows the consumer to experience a thin skinned, lustrous colored, sweet hot, licorice tasting product that is great for stews, soups , sauces, salsas, chili con carne and any classic Tex-Mex offering. These chiles are used for cooking and flavoring.